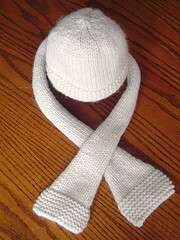 I’ve been knitting, but not blogging much lately. I recently had to change hosting as my lovely, free hosting company decided to close up shop this month :(. The switch went seamlessly which really surprised me. I was expecting some down time for this site. Scarf and Hat out of 6-strand carded fleece (I love this stuff). A couple things about this project. I love the fleece and want more! I’m happy with my hat, but not the scarf. I didn’t have enough of the cream fleece to make the scarf long and I won’t have any to make mittens. Since the fleece was purchased by my grandma over 20 years ago it’s unlikely I can buy a matching dye lot of this. I could try to find more for the mitts though. 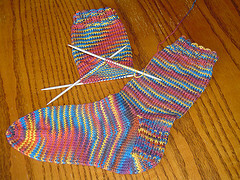 Yarn Harlot’s Recipe for socks has helped me create these as I ride the bus to and from work. 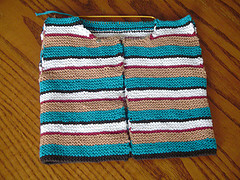 Garter Stitch Cardigan (going very slowly – I keep getting distracted). Next: Glad to be back!